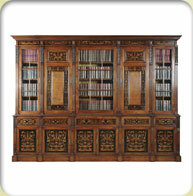 We also create copies of some of the finest quality English and Continental furniture ever made. Furniture can be custom built in our "bespoke" workshop by our own cabinet makers and dedicated restorers. We use 100 year old timbers and all items are made and polished using traditional techniques. You are invited to visit our workshop to inspect the craftsmanship and meet our cabinet makers and dedicated restorers.